North Omaha has seen its share of organizations over the years impose programs on the community to address some of the endemic problems facing that area’s most challenged neighborhoods, most of which have to do with poverty. As well intentioned as those organizations and programs may be, too often they end up as temorary or incomplete responses that come off as missionary projects designed to save the disadvantaged and misbegotten. Decades of this has resulted in a certain skepticsim, even cynicsm, and downright resentment among residents tired of saviors riding in to save the day, and then leaving when either the work is supposedly done or proves too daunting or the grant funding runs dry. To be fair, plenty of these do-gooders have stayed to fight the good fight and to make a postive difference, block by block, neighborhood by neighborhood. One of these is Abide, which also goes by Abide Omaha and which used to be called the Abide Network. 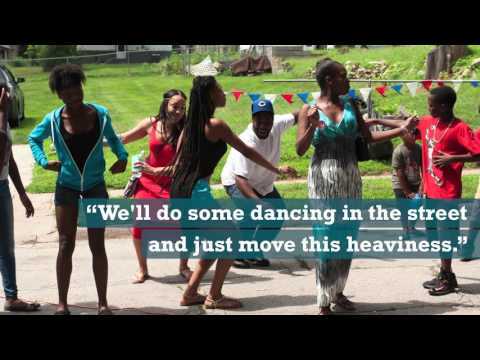 Whatever its name, Abide has put down some serious roots in North Omaha over its 25 year history and the seeds of its community building work are just now beginning to blossom. Read about how Josh Dotzler, a son of Abide founders Ron and Twany Dotzler, is now leading the nonprofit in building Lighthouses in neighborhoods to provide hope, stability, fellowship, and community. Read my cover story about Abide now appearing in The Reader (http://www.thereader.com/). Former Bellevue West hoops star and Creighton University point guard Josh Dotzler has lived through the saga of Abide, the northeast Omaha ministry his parents started in 1989. Twenty-five years ago Ron and Twany Dotzler stepped out on faith to move their large multi-cultural family – he’s white and she’s black – from the suburbs to the inner city to pursue a community-focused calling. Gangs were first asserting themselves. Shootings and killings became endemic. Through their nonprofit the couple responded to conditions giving rise to crime, poverty and hopelessness. Josh and his family have lost neighbors and friends to gun violence. Others have ended up in prison. Residents are skeptical of do-gooders coming in from outside. As Abide’s front person Ron Dotzler battled credibility issues as a white preacher in a black community. The light-skinned Josh and his rainbow-hued siblings – all 13 of them – had to prove themselves, too. After establishing the ministry as one not just passing through but there to stay, Abide made traction. Josh’s parents have since handed the leadership reins over to him. He admires his parents’ courage to climb out on a limb as a mixed-race couple doing street missionary work while raising 14 kids. His parents feel being an interracial duo has been a help not a hinderance. Josh admires the path his parents blazed for him to follow and the sacrifices and risks they took staying true to it. Seven years ago Abide went from tackling select problems such as gang activity to taking a holistic, immersive neighborhood approach. Together with church partners it began “adopting” blocks to make its presence felt through celebrations and cleanups. It also started acquiring, rehabbing and occupying abandoned homes to create Lighthouses that bring stability to transient areas. 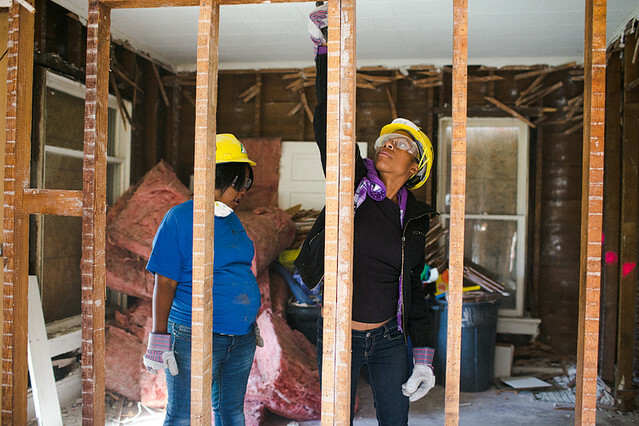 Abide networks with contractors and churches for donated materials and human resources. This new approach is modeled after what the Dotzlers did on their own block to build community. Following their lead, neighbors fixed up their houses. Front porch talks became common. Criminal activity dropped. He says Abide’s work to beautify properties and foster fellowship helps residents take more ownership in their community, which dovetails with OPD’s Neighborhood Stakeholder’s strategy. He says Abide’s well-attended events give police welcome opportunities to interact with the community in a positive light. He champions Abide taking rundown, vacant properties and flipping them into occupied homes again. Dotzler says, “One abandoned house with broken windows can be a magnet for negative activity that messes up an entire neighborhood. We see that all over the place. Within a one-mile square radius of us there’s over 100 vacant homes. A Lighthouse can transform an entire community by providing light where there was dark.” He says these homes serve as safe anchors and resources. Lighthouse residents are supports and facilitators as well as conduits to Abide and Bridge. Lighthouse residents sign covenants pledging to engage neighbors in ongoing fellowship. It’s all part of Abide’s integrated approach to build community, one person, one family, one block at a time. “You can’t just focus on one aspect of a person’s development or a community’s development,” he says. “You can’t just focus on education and expect crime to go down. You can’t just focus on building a house and expect that community to change. You have to focus on taking that dark side of the neighborhood, which was that abandoned house, fixing it up, putting a family or a person into that house that is a part of the change for that community, and providing the programs for people to develop, whether it’s in education or employment. Jennefer Avant, her husband Damone and their son DJ reside in a two-story, three-bedroom Lighthouse on Larimore Avenue. The family reaches out to people on their block to create community. “We do a neighborhood block party and clean-up. We do one-on-one outreach to neighbors,” Jennefer Avant says. “We have a neighbor renovating a home with no running water and we’ve made our outside spout available for him along with our outside electric sockets. We have extended our own time to help if he needs us, we’ve shared our wood for his outside fire pit, and we’ve provided a warm meal. Dotzler says, “All our programs are built around providing relationships with people who can paint a picture of what life can be like.” Much of Bridge’s work is directed at youth and young adults. “It’s mentors coming alongside young people, spending time with them, speaking into their life, encouraging them and helping them become who we believe they’re created to be,” he says. Hanging from a wall at the Abide offices is a city map with pins charting every homicide committed in Omaha since 1989. Bridge leaders are from the community and thus “have the relational equity to engage” with everyone from elders to Young Gs. Abide’s increased imprint has seen it go from a single adopted block to 100 and from one to 20 Lighthouses. Seven new Lighthouses are being readied for occupancy. Abide block parties have gone from a couple hundred attendees to 2,000-plus, outgrowing the Abide site and moving to nearby Skinner Magnet Center at 4304 No. 33rd St. Similarly, Bridge has outgrown the Lake St. building and now holds services at North High School, where 500 followers gather on Sundays. Thousands of volunteers annually work on Abide projects and programs, from painting houses to mowing lawns to mentoring kids. Skinner Magnet principal Tarina Cox says the block parties Abide throws at her school are inspiring. Skinner also partners with Abide on hosting an annual Thanksgiving dinner that draws hundreds as well as neighborhood festivals, Easter egg hunts, staff appreciation days and backpack giveaways. Dotzler says he and his parents believe that overturning the foundational poverty that keeps people in despair or isolation requires addressing not only education, jobs and housing but “love, safety, care, nurture,” adding “People hunger for someone who actually cares and wants to see your needs met and see you become successful. At the heart of it is a hunger for spirituality, for purpose in life. Abide’s growth has coincided with its more organic approach. “We have partners come in and take on these specific neighborhoods, again not just doing a program but building relationships in that community that carry on past just a house getting refurbished. It’s more than providing a service, we’re creating a whole new culture and where you’re creating a new culture you better make sure you’re addressing the different cultural realities there. Dotzler loves his work but didn’t expect to be doing this. The 2009 Creighton grad saw himself playing ball overseas and going into business. There was no succession plan for him to take over Abide but seeing his parents grow it made an impression on him. “I got to see a picture of what it looked like to live with purpose, passion and something that was bigger than yourself,” he says. But he didn’t think he was up for the job and so he resisted it even as his parents nudged him to be more involved. “I’ve never seen people step back with more humility,” he says of his parents. “I wouldn’t even be here if it wasn’t for them pushing me here. Finally, with his older siblings variously away or enmeshed in their own careers, he committed to Abide and for his own family – he and his wife have three kids – to live in a Lighthouse. “My wife gave me a three month ultimatum. She said. ‘Let’s move here for three months and then move somewhere else.’ We both said let’s give it a try and see what happens, and we’re still trying it out five years later. But we really feel like this is where we’re supposed to be. He says a good day on the job can mean many things. Making progress in any area satisfies him. He says it’s not about plaudits, though his parents have received their share and have many admirers. Jennefer Avant makes no bones about the impact the Dotzlers make. 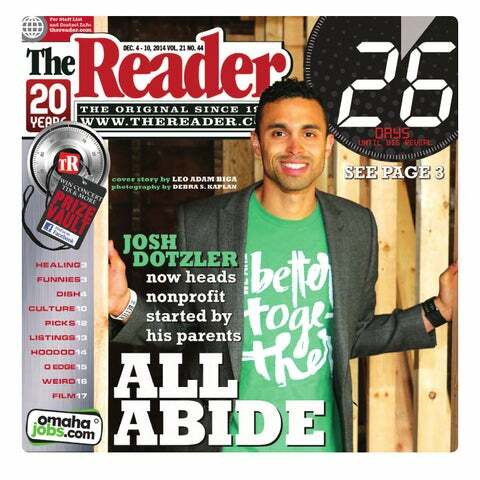 Josh Dotzler just wants to take Abide where community needs lead it. He’d like to one day scale up to 700 Lighthouses. Whether that happens or not, he wants to make Abide a part of the solution.